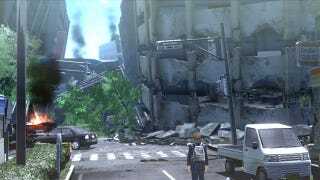 In the wake of Japan's devastating earthquake and tsunami, publisher Irem canceled its catastrophe survival adventure Disaster Report 4, a game that was due to hit Japanese PlayStation 3s this Spring. Now it's halting production of every other Disaster Report game. Andriasang, citing Japanese retailer Famicom Plaza, reports that the PlayStation 2 and PSP releases in the Disaster Report series (née Zettai Zetsumei Toshi) will no longer be produced. The most recently released entry, the Japan-only Zettai Zetsumei Toshi 3: Kowareyuku Machi to Kanojo no Uta, was released for the PSP in April 2009. It was re-released as a budget-friendly greatest hits title—"The Best" in Japan—earlier this year. The Disaster Report games typically involve players trying to survive in the midst of natural disasters, primarily earthquakes, by seeking food, water, shelter and medical supplies, while also helping other victims of the disaster. The fourth game in the series would have been the first for the PS3, supporting PlayStation Move and stereoscopic 3D features.